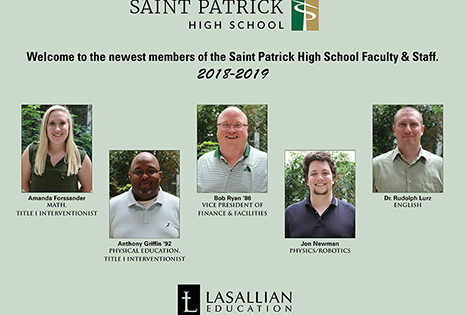 Saint Patrick High School is pleased to welcome five new faculty/staff members for the 2018-2019 school year. Amanda Forssander has her Bachelor’s Degree in Mathematics Teacher Education from Illinois State University and Associate in Arts from Harper College. Amanda worked at Maine West High School for the past three years as a Geometry Response to Intervention (RtI) Instructor, Head Frosh/Soph Softball Coach, Summer School Instructor and Running Guide for Boy’s Cross Country. She will serve as a Math Teacher, Title I Interventionist and Assistant Volleyball Coach at Saint Patrick and says she’s excited to provide meaningful experiences for students to become well-adapted and well-rounded individuals in an ever-changing world. Anthony Griffin ’92 is returning to Saint Patrick as a Physical Education Teacher, Assistant Varsity Football Coach and Head Track Coach. Anthony was inducted into the Shamrock Hall of Fame in 2013 for football after receiving a full scholarship to play at Northern Iowa. He transferred to Northern Illinois University in 1994 where he received his Bachelor’s Degree in Sociology. He has a Master’s Degree in Athletic Administration from Ohio University and over 15 years coaching experience. Anthony has four kids with his wife. Juanta: Taylor, Ajani ’20, Jayden ’22 and Adeyemi. Bob Ryan ’86 started in early June as the Vice President of Finance & Facilities. He has a Bachelor’s Degree in Accounting from the University of Illinois at Chicago and worked at the State’s Attorney’s Office for the past 25 years. Bob and his wife of over 24 years, Nancy, have two sons: Bobby III ’15 and Marty ’18 who are both attending the University of Dayton. His father, Deacon Bob Ryan, Sr. ’61 and brother Eddie ’84, are among several family members who graduated from Saint Patrick. He says he’s very excited to be starting a new career at St. Pat’s and is looking forward to continuing to make it the best high school in Chicago. Jon Newman studied Physics at Northern Illinois University and is coming to Saint Patrick from Loyola Academy where he taught physics, Science Olympiad and aided in writing the physics curriculum for four years. He is very excited to teach physics and coach Robotics at St. Pat’s. He and his wife, Alyssa, will be married 3 years in December and live in Evanston. Dr. Rudolph Lurz comes to Saint Patrick from Roanoke, VA. In 2017, he finished his doctorate at the University of Pittsburgh with a research concentration on policy formation and political rhetoric. He is excited to teach English at Saint Patrick and can’t wait to show a new generation of students how to make an argument and defend it with evidence. He will also be serving as the Head JV Football Coach.